Honor has taken the wraps off its latest mid-range smartphone, Honor 8X, which has a 91% screen-to-body ratio (that's better than the Galaxy S9, don't you know) as well as 4D vibrations similar to a PS4 controller for more immersive mobile gaming. The new handset also uses AI to filter out problematic background noise from your calls in a bid to ensure your voice is always clear, even if you're stuck on a busy train. On the back of the Honor 8X, there's a dual-camera set-up that combines a 20-megapixel primary sensor with a 2-megapixel depth-sensor for bokeh-filled Portrait Mode-style shots. On the front, Honor has included a 16-megapixel sensor for high-resolution selfies and video calls. Honor claims to have added a truckload of AI smarts into the new front- and rear-facing cameras to improve the image quality. For example, when shooting at night or in low-light conditions, the camera will open the shutter for six seconds to let in as much light as possible and use AI to reduce any blur caused by hand shakes. In the press shots, the feature looks to be hugely impressive, although T3 will need to test the device to see whether it makes our best budget phones list. 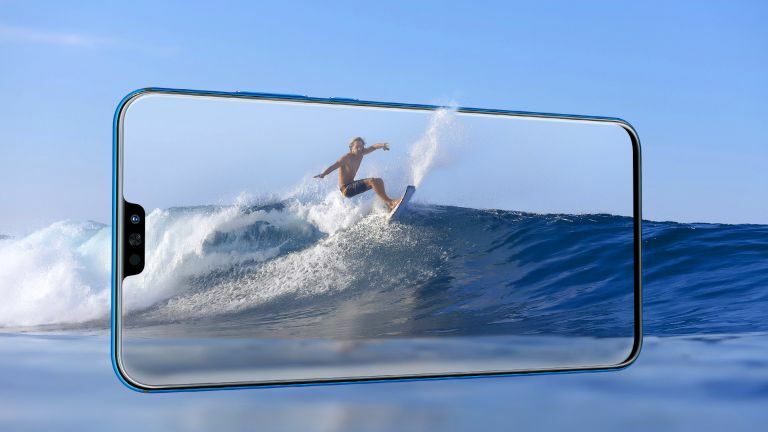 Elsewhere, there's a 6.5-inch screen with a small notch at the top – marking another step towards omnipresence for the controversial display design. Powering the Honor 8X is a Kirin 710 chipset, coupled with 4GB of RAM. There's also a 3,750mAh battery, with 64GB of in-built storage, although it can be expanded up to 400GB via microSD. Honor 8X is powered by the firm's own EMUI 8.2, which is based on Android 8.1 Oreo. Honor 8X will be available buy from October 11 for £229.99 in either Black or Blue finishes from Three UK, Amazon, John Lewis and Argos.